Synopsis: Sophie, a survivor of a Nazi concentration camp, struggles as a Polish-Catholic immigrant in New York with her all-consuming lover, Nathan. The lovers’ drama unfolds through the observation of a new friend and would-be writer, Stingo. As the trio grows closer, Stingo discovers the hidden truths that they each harbour. Did You Know? 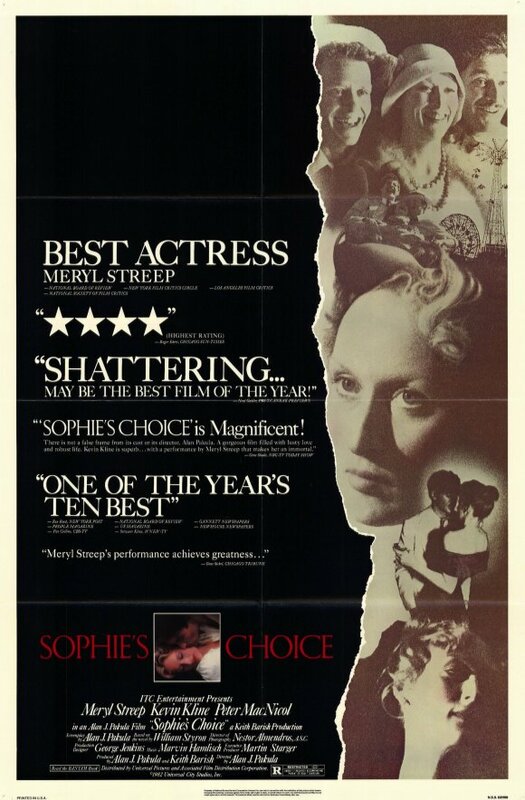 Meryl Streep performed “Sophie’s choice” scene in one take and refused to do it again, stating that she found it too painful and emotionally draining, as a mother. She never watched the scene until more than ten years later when she was on The Oprah Winfrey Show, and Oprah had chosen that clip to show the audience. Quotables: SOPHIE: Stingo, you look… you look very nice, you’re wearing your cocksucker. If there was a film to prove that Meryl Streep’s talent knows no limits, it’s this one. She is known to master almost dialect, and perhaps a native Pole could find a flaw in hers, but she sounds perfect to me. And that’s more than I can say for most American actors attempting to do any sort of accent. And then we get to the latter half of the film and she takes it one step further by speaking Polish and German with the finesse and rapidity of a native speaker. The scene at the end where she has to choose whether her son or daughter be taken to the gas chamber is a most horribly gut-wrenching scene. Certainly one of the best performances in film history.